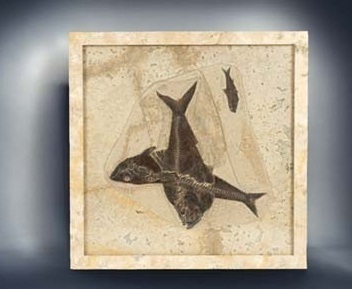 Description: This fossil plate comes from the world famous Laggerstatten Green River. The site produces a large extent of soft tissue preservation as evidenced by this fish. The fish present on this rare and interesting plate are as follows: Mioplous is an ancestor of the Perch and was a voracious predator. Often they can be found in the fossil record eating other fish. It is easily identified by its elongated shape and canine-like teeth. Knightia, the small fish, is the state fossil of Wyoming. They were at the bottom of the food chain and were schooling fish, which is why they can often be found together on fossil mortality plates. Diplomystus is distantly related to modern herrings and was a surface feeder, as shown by their upturned mouths and body shape. They fed on smaller fish such as the Knightia. The preservation on this one off plate is superb, with an impression of scales and the dark bodies a wonderful counterpoint to the light matrix. During the Eocene the region was sub tropical to temperate. This is the best quality specimen we have ever obtained and is true museum quality. A terrific investment opportunity, as well as a fine one off piece of art.